Nature's Way 5-Hydroxytryptophan is the precursor to serotonin, a mood and appetite regulating neurotransmitter produced within the body. It has been combined with Vitamin C and Vitamin B6, an important cofactor in the conversion to serotonin. 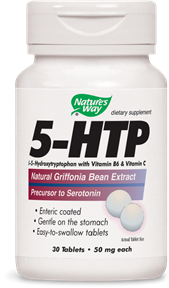 Nature's Way uses natural l-5-HTP extracted from Griffonia simplicifolia beans. Use under the guidance of a healthcare practitioner. Start with a low dose of one tablet (50 mg) taken daily with a meal. Increase the dose slowly (every 3-5 days) up to a maximum of four tablets taken daily (200 mg). Total daily intake should be divided into two or more doses, with no more than two tablets per dose.